I love to bake, I mean is not a passion per se, but being able to make your own stuff and experiment new things is just awesome. 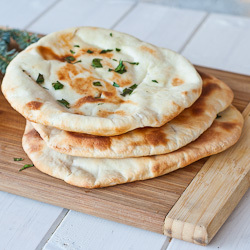 However, I do have a passion for bread :P and this beautiful Naan is my latest fixation. I have been making it continuously for the past couple of weeks and I don’t think I had enough yet. :) Anyway, here’s my recipe. Enjoy! I always start by activating the yeast [duh], which is pretty basic as you probably have noticed. Pour ⅔ cup of water in a measuring glass, add 1 tbsp sugar, 2½ tsp of dry yeast and let it do its thing for 10 minutes. Measure ⅔ cup of plain yogurt. When you are done, oil the dough, cover it with a cloth or saran wrap and let it rise until it doubles in size, usually 2-4 hours but heck I never wait that long, I’m getting hungry fast when I bake. Turn your dough onto a floured surface and knead it for another minute, then cut it into 8 equal pieces. Roll them to the size that you want but not very thin though. In my example I added some chopped basil but only on a couple of them, I got bored afterwards. While you flatten them out, preheat your oven to 450° F / 230° C. Now, here’s the thing, some people use a pizza stone to bake them, in which case you need to have a pretty high temperature, like 500° F / 260° C, but I am using a regular cookie sheet with a drop of oil on it. Pour ⅔ cup of water in a measuring glass, add 1 tbsp sugar, 2½ tsp of dry yeast and let it do its thing for 10 minutes. Add 3½ cups of flour in the bowl of your mixer, 1 tsp of baking powder, 2 tbsp vegetable oil, 1½ tsp salt and mix them all together for a bit. Add yogurt and yeast to your flour mix. When you are done, oil the dough, cover it with a cloth or saran wrap and let it rise until it doubles in size, usually 2-4 hours. Turn your dough onto a floured surface and knead it for another minute, then cut it into 8 equal pieces. Roll them to the size that you want but not very thin though. Preheat your oven to 450° F / 230° C, I am using a cookie sheet with a drop of oil on it. If you are using a pizza stone to bake them, preheat to 500° F / 260° C.
They look amazing and super easy…. How large are the circles when rolled out?.. Looks so good! Hahahah it is not rocket science, about 10 inches (25cm) in diameter. Good luck! skillet works great, tried it before.